Metropolitanos de Mauricio Baez (TBS) signed 30-year old American forward Duke Crews (203-106kg-88, college: Bowie State). 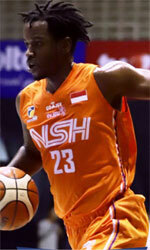 He just played at played at CLS Knights in Indonesian IBL league. In only one game he recorded very impressive stats: 16 points, 10 rebounds, 4 assists and 1 block this season. The last season Crews played at Rain or Shine in Filipino PBA where in 5 games he had also remarkable stats: 18.2ppg, 14.8rpg and 1.2apg. The list of the past achievements is quite long as among others his team was regular season runner-up in Indonesian IBL in 2017. Crews was also voted Asia-Basket.com All-Japanese BJ League Honorable Mention in 2016. He is quite experienced player. Crews has played in seven different countries on four different continents (Europe, Asia, Latin America and of course North America). He has played previously professionally in Bahrain (Al-Ittihad and Sitra), Mexico (Frayles de Guasave), Ukraine (DniproAzot), Uruguay (Tabare), Venezuela, Philippines (SM Beermen) and Japan (Toyama Grouses and Cyberdyne Ibaraki Robots). Crews attended Bowie State until 2010 and it is his eighth season as a professional player.